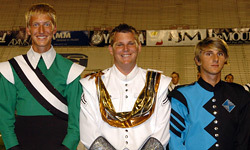 at the 2008 DCI World Championships. During the coming summer months, the average high school or college student will spend up to 500 hours working a part-time job to earn money for school and other expenses. Participants in Drum Corps International performing groups will devote these same summer months to the incredible opportunity of putting themselves on the football practice field, rehearsing hundreds of hours for the chance to perform in front of thousands of dedicated fans – a far cry from the "average" lifestyle of a typical undergraduate. Approximately 70 percent of more than 5,000 drum corps participants are full-time students at higher educational institutions, and in a world with increasing tuition and text book costs, members of the Friends of DCI program understand the financial challenges these corps members face. Last year, $6,000 in academic scholarships raised by generous contributions from Friends of DCI members, was awarded to students who excel both on and off the field. This summer, the Friends of DCI will award up to three academic scholarships of $2,000 each to corps members participating in the 2009 Drum Corps International Tour. High school seniors or college students enrolled for courses in the fall of 2009 who are current members in good standing of an Open or World Class corps competing in the 2009 Drum Corps International Tour may apply. The application deadline is Friday, May 1, 2009, and recipients will be recognized this August at the 2009 DCI World Championships in Indianapolis. About the Friends of DCI Founded in 1981, the Friends of DCI (FDCI) program began with a dedicated group of some 30 passionate drum corps fans who came together and decided to donate a few dollars more than the value of their tickets, with the hope of contributing to future generations of Drum Corps International and its corps. Each year, FDCI members manage two special programs including the "Friends of DCI Scholarship," awarded to corps members who excel on the field and in the classroom, and the annual "Volunteer of the Year Awards," which acknowledges the unsung heroes who are the lifeblood of each participating corps.